South African Airways Airbus A340. HUNDREDS of people were yesterday stranded after South Africa's decision to ban Air Zimbabwe flights due to non-payment of permit fees invited a retaliation by Harare, which ground planes operated by the neighbouring country's national carrier. Passengers that were booked on South African Airways (SAA) flights out of Harare, Bulawayo and Victoria Falls Airports failed to travel as scheduled. Zimbabwe also grounded British Airways flights over the same issue. The South African Civil Aviation Authority on Friday night grounded the Air Zimbabwe flights after the airlines failed to renew its foreign operators' permit, together with other documents, which must be on board an aircraft at all times. Yesterday morning, the Civil Aviation Authority of Zimbabwe (Caaz) took similar action against SAA, catching travellers by surprise. Transport minister Jorum Gumbo admitted Air Zimbabwe bosses had slept on duty and failed to renew the permit, but denied charges that Zimbabwe had retaliated. "There is what is called operator's licence, which is renewed periodically," he said. "So Air Zimbabwe had not renewed its licence and South Africa Airways had also not renewed its own licence." SAA said they could not operate Flight SA025 from Harare to Johannesburg at 7am and Flight SA022 , which was scheduled to depart at 10:45am from Johannesburg to Harare, had also been cancelled. "Every effort will be made to assist all affected passengers and our recovery plans have been activated," SAA spokesperson Tlali Tlali said. "SAA is monitoring the situation and will provide updates on a regular basis and when there are developments." In Victoria Falls, passengers had to be shuttled to Zambia's Livingston Airport where SAA planes were now landing and taking off following the standoff. Meanwhile, South Africa's Transport minister Joe Maswanganyi will be meeting all aviation entities from the department to discuss the grounding of the Air Zimbabwe aircraft. 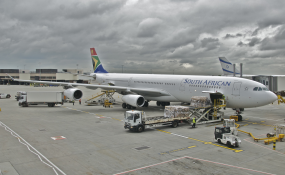 "As a result, the South African Civil Aviation Authority has instructed the operator not to take off until such time that there is full compliance with the applicable South African civil aviation regulations and the requisite international aviation standards as set by the International Civil Aviation Organisation." Maswanganyi apologised for inconveniences that might have been caused to passengers, the department said. "In the same vein, the minister emphasised that civil aviation safety and security is critical, and all licence and permit holders operating into and within the South African airspace need to comply with the applicable international standards, and the South African civil aviation regulations." The Friday flight was set to take off for Harare shortly after 6pm, but was cancelled before then. President Robert Mugabe and his wife Grace are in South Africa for a Sadc summit. Mugabe's personal airplane, operated by Air Zimbabwe, is not believed to be affected by the cancellation. DA shadow deputy minister of Finance, Alf Lees however, disagreed saying the grounding flights, between SAA and Air Zimbabwe, seemed to be due to the diplomatic impasse over the assault charges against Grace. "Now, it seems that tensions between Zimbabwe and South Africa are mounting, leading to airlines being grounded." He called on Finance minister Malusi Gigaba to urgently address "these concerning incidents". "The silence from our government on the Grace Mugabe matter has been deafening," he said. "The reality is that the South African government has completely mishandled this situation, which is now affecting the operations of the national airline." A "red-alert" was issued by police in the event that Grace attempted to cross the SA border after she allegedly assaulted a 20-year-old model in a Sandton Hotel on Sunday. Copyright © 2017 Zimbabwe Standard. All rights reserved. Distributed by AllAfrica Global Media (allAfrica.com). To contact the copyright holder directly for corrections — or for permission to republish or make other authorized use of this material, click here.